Following a third series that toyed with storytelling conventions as time itself was called into question, Jago and Litefoot returns more to its roots for its fourth outing, retaining the services of Louise Jameson as Leela and bringing in the ever-enthusiastic voice of Colin Baker as the mysterious Professor Claudius Dark to join Christopher Benjamin and Trevor Baxter as the investigators of infernal incidents hit the streets of Victorian London once more. Opening the fourth series is Nigel Fairs’s ‘Jago in Love,’ a tale that does exactly what its title suggests as Henry Gordon Jago, Professor George Litefoot, and Leela head to Brighton to escape the presence of Professor Dark and to relax following the harrowing events of the third series. The investigators have been through a tremendous amount of emotional distress, and seeing Jago fall so deeply for a singer on the local stage is a refreshing change of pace that Benjamin commits to with aplomb. Played wonderfully by Elizabeth Counsell, Abigail Woburn is the perfect match for the boisterous Jago, strong in her own right and always there to listen to his more boisterous claims while never once failing to keep his thoughts and concerns in mind. Jago sees his life without her as a dismal and grey one, and his claims to be the basis for Arthrur Conan Doyle’s Sherlock Holmes and his accidental ruining of his own proposal to Abigail are perfectly in line with the overzealous and garrulous nature of the character. As Litefoot points out, the notion that Jago is willing to spend money on Abigail suggests just how serious this relationship is, and Leela’s rather overt suggestion that Jago wants to mate with Abigail is met with the requisite horror from Litefoot that a gentleman of his standing would rightly show. Quite fittingly, the mystery of the story does not revolve around a secret identity pertaining to Abigail who seems to be, in fact, simply a woman for whom Jago has fallen. This has the heartbreaking effect of showing Jago just how incompatible his lifestyle with Litefoot is compared to the more straightforward life of love he desires would be as he chooses to continue righting wrongs instead of pursuing his own happiness. Accordingly, the mystery of the mirrors and the fun fair offers a suitably haunting tale about a couple trapped between worlds, George and Mary having both perished in the snowstorm as foretold by Gypsy Nancy. With George not realising he has died and searching all of Brighton for his beloved, this oft-used concept transfers to this supernatural-ridden Victorian era exceedingly well and leads to a surprising reunion scene featuring the couple as enacted by Jago and Litefoot themselves. The tone of ‘Jago in Love’ is undoubtedly much lighter than the typical tale in this range, but the usual evocative atmosphere and the incredible range of softer emotions Benjamin as Jago delivers alongside the more emphatic sentiments Baxter as Litefoot conveys in his most unexpected role make for a strong opening act that shows just how indomitable and inseparable these intrepid colleagues are. Following a strong debut with series three’s ‘Swan Song,’ writer John Dorney returns to the range with ‘Beautiful Things’ in which Jago, Leela, and Ellie go to the theatre to catch Oscar Wilde’s latest courtesy of the mysterious Professor Dark but soon discover a most sinister presence during the interval. Litefoot has preconceived notions about Wilde, and he quite brashly proclaims his works as terribly grand people being terribly witty about things that mean terribly little, and it’s fitting that Leela finds all of the characters unlikable and is excited to leave at the interval which she believes to be the play’s end. And although meeting the famed author does not necessarily change preconceptions, Alan Cox imbues an incredible intelligence, weariness, and dry humour to the role of Wilde who very clearly knows his own prowess with language that makes him- through Jago’s fawning to get in his good graces and perhaps secure a commitment to his theatre- a formidable presence to stand alongside Jago and Litefoot as events take a decidedly ominous turn. Proving his gentlemanly stature after refusing to accept Dark’s seemingly suspicious offer by providing seemingly endless amounts of tea to those working on repairing his home, Litefoot is the one to piece together through the two-pronged investigation into the spate young men being found dead as if their brains had just stopped that the twenty-year-old Gad and his infirmed father are, in fact, the same man. Inevitably and quite overtly drawing comparisons to Wilde’s own The Picture of Dorian Gray in which a member of the aristocracy owns a painting that bears the burden of age and illness for him, Gad has his own living being within an infinite library with every book and painting conceivable to do so for him, mutating the very core notion of a TARDIS into something altogether more dangerous. Yet art without morality is nothing worth pursuing as Wilde proclaims, and the prospect of the library continuing to take an increasing amount of sustenance from peoples’ minds with no care for the devastation and devoid landscape left in its wake is uniquely threatening in both concept and scope. With Leela at her most instinctive and able to cope with the library due to her previous experiences with the Doctor as the script emphasises the very best aspects of the investigative nature of Jago and Litefoot now that Jago has recovered from his brief time with his beloved Abigail, ‘Beautiful Things’ is a touching homage to a classic work that makes the most of Wilde’s presence and provides a great example of the heights this range can reach. With Misters Kempston and Harwick revealed as the villainous presence, Matthew Sweet’s ‘The Lonely Clock’ wastes no time with exposition as Jago and Litefoot try to come to understand the mystery surrounding the immobile train plunged in darkness surrounding them. With people frozen on platforms and shadows masking vast swaths of the environment, the setting is drenched in atmosphere and provides a novel conceit for a very descriptive form of dialogue that flows naturally without ever feeling intrusive. Similarly, while not a completely novel approach, the impact of having Jago and Litefoot see what will happen to Leela and Ellie and then flashing back to show the events leading up to that moment is very effective and certainly does carry with it an increasingly impending sense of tension. With time itself a variable, the imagery of the hours flying by in either direction on a pocket watch is simplistic but valuable, and the introduction of Victoria Alcock’s Winnie is handled deftly to make her seemingly villainous character nuanced and layered from the outset before her true motives are revealed. Indeed, Winnie’s time cracker watch that creates spatiotemporal disturbances is quickly put into context, and the scope of the nefarious plan to bring the Doctor who has been masquerading as Professor Dark out of hiding is staggering despite its relatively overcomplicated nature and certainly carries an emotional resonance through Winnie’s attempts to alter her mistakes that adds a much needed depth to the atmospheric but technobabble-laden plot. Sadly, Colin Baker does not have the opportunity to come to the forefront until the end of this serial when he finally reveals his true identity, a bit of a letdown given that his involvement has been telegraphed since the cliffhanger ending of the third series. Nonetheless, this again does not serve as a detriment to ‘The Lonely Clock’ which is able to tell a wholly engrossing tale that makes the most of all of its leads as well as its compelling guest cast. In place of the usual banter and familiarity of friendship that often pervade scenes featuring Jago and Litefoot is an inherent sense of unease and tension that presents a subtle shift in dynamics and tone that works exceedingly well by showing just how creative and capable these two investigators truly are, and Litefoot gets a rare opportunity to truly show off how proficient with his trade he truly is. Intriguingly, as Winnie occupies two spots in the plot, Leela discovers straight away that Winnie has murdered her betrothed but dismisses it as rather unimportant given the bigger battle at hand, proving just how distinct Leela is as a character within the confines of this range and its Victorian ideals. Though the resolution is a bit underwhelming given the strength of the events and mystery preceding it, ‘The Lonely Clock’ is another strong outing that again highlights just how confidently this audio range can incorporate different genres into its repertoire. 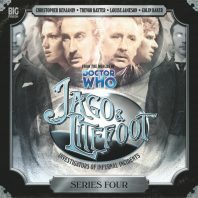 With the sands of time in pursuit of Jago, Litefoot, Leela, and Ellie and the decision of their lives imminent, ‘The Hourglass Killers’ from Justin Richards closes out the fourth series with the Doctor decidedly present in the hunt for the cause of the temporal anomalies. Beginning with the superb image of Lord Ampthill encased in a tremendous hourglass as the sand continues to mount around him, Richards certainly does not shy away from imagery here, and the crude hourglass technology that allows a sort of manipulation of time to make journeys shorter is a unique concept that blends aspects of the past and future together perfectly. The revelation that Kempston and Hardwick are the pilots of a crashed Temperon ship who want to learn the secrets of true time travel works well and explains both the Doctor’s involvement and Leela’s inability to leave following the previous series. Proving just how ruthless these villains can be beneath their ostensibly gentlemanly and lighter demeanour, they crafted Abigail as a weapon to use against Jago to help with their means, and the fact that Abigail develops a mind of her own and knows without a doubt that Jago loved her provides an unexpectedly but incredibly poignant moment before the inevitability of her fate manifests. Colin Baker gels with the main cast of the range with ease, and his more boisterous Doctor who pays little heed to his surroundings when talking makes for a unique presence that at times even outshines the boisterous nature of Henry Gordon Jago himself. Having hidden his TARDIS beneath the Thames to keep it safe, he finally gets the chance to show off his own Statenheim remote control after bravely taking it upon himself to lead the charge to save the world. Litefoot’s regard for Professor Dark changes immediately upon learning that he is none other than the Doctor, and the duo of Jago and Ellie pretending to be the Doctor and Leela to lead their enemies astray is certainly a visual and comedic highlight that over-accentuates the unique aspects of these beloved characters. As the aptly-named villains lead the heroes to Bedfordshire, Leela is also able to prove her mettle and bravery while still reminding everyone around her that she is not wholly familiar with the usual actions and rituals of this time. Louise Jameson has unsurprisingly fit in perfectly alongside Christopher Benjamin and Trevor Baxter over the past eight stories, and the addition of the Doctor to the mix only further highlights what a versatile actress Jameson is and what an incredible character Leela is in terms of potential characterisation and storytelling options available. Finally making good on the promise of Colin Baker’s involvement and sporting visuals aplenty and a satisfying villainous presence that ultimately leads to Jago and Litefoot stepping upon the TARDIS for journeys unknown, ‘The Hourglass Killers’ is an engaging and emotional end to this fourth series that as a whole represents an immersive return to form and the most consistent yet thanks to strong scripts, performances, direction, and sound design that once more bring the streets and hidden corners of this Victorian London to life expertly.